So, you’ve fallen in love with one of my geckos. Well, I can’t blame you. Here’s what to do next! Read the terms below. All the terms. Not some, they&apos;re important! Drop me a message, via Facebook, or Tumblr, or even an email to and let me know which animal(s) you are interested in, as well as your zip code, so I can give you a shipping quote. (Unless you’re planning to pick up in Suffolk County, LI, or meet at an expo. I am also in the Pittsburgh and Bethesda areas periodically can can arrange pickup there.) 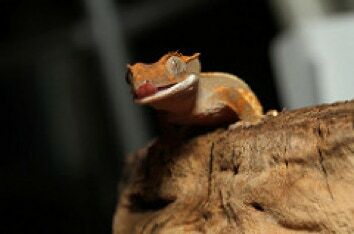 It would also be good if you could let me know if you have experience with crested geckos. Once I get the message, I’ll get back to you asap. Know this: I’m not shipping your gecko without contacting you first and confirming that you know your gecko is coming. If I cannot get a hold of you on the day before the expected shipping date, that shipping date will change. This is so that geckos don’t get left outside in weather that’s too hot, or too cold. No one wants that, particularly the geckos. Holds: I do not charge to hold geckos for acceptable shipping weather. However, if you are not willing to wait, please do NOT purchase that gecko, until it is paid for (or an agreed upon deposit is left,) that animal will still be available for sale. What is appropriate shipping weather? On BOTH ENDS of the transaction (that means Suffolk County, NY (11951) and wherever you happen to be) temperatures must be between 40 on the low end and 80 degrees Fahrenheit on the high end. I ship with heat and cool packs to ensure the comfort of the animals. Animals that cost $100 or less must be paid in one full payment. For animals over $100, you may make non-refundable down payment equal or greater to 25% the cost of the gecko. This down payment is good for 30 days. After 30 days, if the full payment is not received, the transaction will be void, minus the deposit, unless specific terms to the contrary have been established, clearly, and in an email or other written format. Exceptions can sometimes be made depending on your situation, so to be 100% sure, message me through my facebook page, GeckoPods. If you would like to pay via PayPal, you can utilize the PayPal credit option. For payments of $99 and up, you will get 6 months to pay without interest. Utilizing this option means your gecko can ship immediately, while you are still making payments! Animals WILL NOT SHIP until full payment, including shipping, is received and cleared. Shipping costs: Shipping costs vary by location. My geckos ship out of 11779, to get an estimate you can go to www.shipyourreptiles.com. I charge only one price for up to three geckos. During times of short shipping windows due to extreme weather, this means we may not be able to take partial payments as deposit. Picking up in person: If you’re on or near Eastern LI and would like to pick up your gecko, you may do so ONCE THE GECKO IS ENTIRELY PAID FOR. You must pre-pay before the gecko will be going home with you. That means you cannot pay in-person via check, but cash, or PayPal is fine. I will ship to the continental United States. Shipping averages around $60, but may be more or less depending on how far you are from Long Island. You pay shipping only one time per order, no matter the number of geckos you choose to purchase. I ship via FedEx Priority Overnight, insured through ShipYourReptiles. Generally speaking, Fedex Priority Overnight shipments arrive by 10:30AM. However, science is all theory and this can vary depending on how far you are from your local hub. To find out when your package is supposed to arrive according to the FedEx website, please ask before ordering. I can also ship via Reptiles2You. This can sometimes be a couple of dollars cheaper, but they do NOT offer a live arrival guarantee. If you are cannot spend a whole day waiting for the package (or having someone wait for you) we can also ship as “hold for customer” if you have a local FedEx hub to which you can go to pick up packages.Sometimes delays happen that are beyond anyone’s control. These include incidents such as inclement weather or airplane mechanical issues. I am not responsible for carrier delays or other issues with the carrier, but I will work with you to keep you informed of delays. I pack well, so even late geckos arrive healthy and safe! I ship only Mondays, Tuesdays, and Wednesdays for next-day arrival, as weather and schedule allows.Payment is accepted through Paypal; we can also receive credit card payments via Paypal. Shipment is made to the address listed in the Paypal fields, so please make sure your Paypal information is up-to-date when making payment. Your contact name and Paypal/shipping info must match. We will verify your shipping address with you before shipment and also ask that you have a contact phone number available to add to the package. • Loss of contact: If you make payment and lose contact without warning (i.e., I am planning to ship soon, and you are due to make a payment on your payment plan), effort will be made to contact you for no longer than 2 weeks. At the end of those two weeks, all funds except the 25% deposit, will be refunded and your gecko(s) will be re-listed for others. If you will be out of town/unavailable for longer than 2 weeks, please inform us ahead of time so we do not think you have backed out. I’m totally ok with you going on vacation, just let me know ahead of time that you haven’t disappeared! I offer a one-week health guarantee on all shipped geckos unless otherwise notified; if your gecko falls ill within that week, when returned, we will either replace it if we have a similarly priced animal, or offer a credit for the amount paid to our website for use with other stock.The buyer is responsible for all shipping costs. Important! I MUST be notified via e-mail, Facebook message, or text immediately upon receipt of your gecko. You must be available to accept the package at your door at time of delivery and contact me WITHIN ONE HOUR to let us know the package was received, or this health guarantee is null and void, as leaving a gecko outside in the weather can be harmful. Health guarantee does not include injuries after arrival. Examples of such injuries I do not cover include, but are not limited to: dropping, attacks by other pets, burns, catching your gecko in a door, or choking on inappropriate food or substrate. This guarantee does not include tail loss, which does not affect the health of your gecko. After your purchase: You can absolutely contact me with ANY care questions or just to let me know how my babies are doing! I love keeping up with them no matter where they go! Tag @geckopods on instagram so we’re sure to see your pics!